I thought I’d go over these two concepts really quickly. NAT Pools – When you are overloading a single IP, the truth is that you are using the ports available on that IP to send and recieve traffic and that’s translating to IP’s on the inside. Once you have even a few pc’s you can see from the translation table that many many ports are used, and while these connections tend to get torn down quickly, it’s still quite possible to run out. It really just depends on how many active clients you have to nat. To overcome this, you can create a pool of external IP’s to overload. The router will simply move to the next IP when the first has too many ports full. Lets use the same lab as our last NAT example. Router0 is using 128.128.129.2 as it’s interface. It’s gateway is 128.128.129.1, which is on Router1. If we are using that same lab.. we need to remove the nat command we issued earlier. if you have active connections you will be asked to kill those connections, and nat will of course.. stop. to nat overload, first we need to create a nat pool. 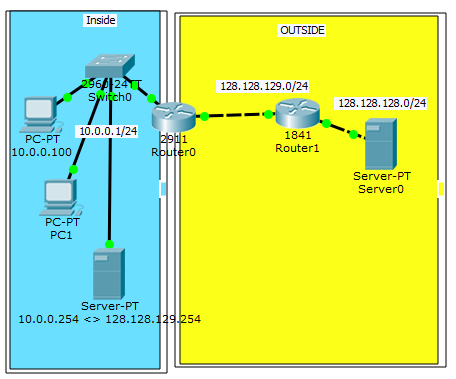 In this example, I want to make ip’s 128.128.129.50 thru 128.128.129.100 available in my pool. and now we simply create our nat using the same ACL we made in our last example. We can now see in in the translations tables the nats being created. This is also really useful to you, if you have an IP that it’s internal and you want to map that IP completley 1 to 1 to another ip on the other side of the router (publicly, for example) you may follow the next example to accomplish this. Now on our other server on the outside we can test access via ping.